Wildflowers are prized by home gardeners because they are low maintenance, and are available in a wide variety of colors, shapes and sizes. You can find wildflower varieties suitable for almost any growing condition--hot and dry to shady and wet. You do not need to have a plot of earth to grow your wildflowers; containers will do nicely. Select wildflower seeds that are either native to your region or are recommended to grow in the environmental conditions in which your container will be located. If you plan to place your containers where they will receive full sun all day long, the wildflowers you choose should be sun loving. Carefully read the back of the seed packages for growing requirements. Fill your container with clean all-purpose potting soil. Your wildflower seeds need a well-draining soil. Plant your wildflower seeds to the depth recommended on the seed package. Most wildflower seeds need to be sown on top, or just under, the soil surface. Because wildflowers in their native setting generally self-seed, most wildflower seeds should be planted as if they fell from the mother plant. In most USDA planting zones, you can sow your wildflower seeds in your container in the fall, September to November, so that the seeds will either germinated then and establish a strong root system before winter, or stay dormant until the ground warms in the spring. 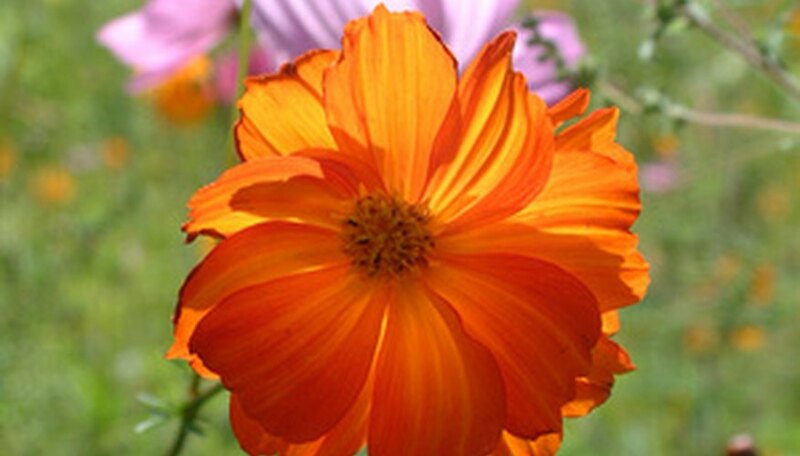 Whether your seeds sprout or stay dormant will depend on the wildflower variety you planted. Water your container soil to keep it moist, not soggy, after you you have planted your wildflower seeds. The soil will need to be kept moist throughout the period your seeds are germinating and until the seedlings have developed a strong root system. Once your wildflowers are 2 to 3 inches high, you can cut back and allow your container soil to dry slightly between waterings. Select wildflower bedding plants that have the natural habitat similar to where you intend to place your container or are native to your region. If you plan to place your wildflower container in full sun, for example, your wildflowers need to be ones that naturally are found in full sunlight. Also, be aware of the compatibility of your wildflower plants in a container. Observe which plants grow together in their natural habit, or consult with your local cooperative extension for advice. For ongoing wildflower blooming, plant a variety of plants that bloom at different times. Plant your wildflower plants in a container that is filled with an all-purpose potting soil that drains well. Be sure you have selected a container that will accommodate the growing root system of your wildflower bedding plants. Water your wildflowers to mimic their natural environment. If the wildflowers normally grow in shaded areas, where the soil is consistently moist, your container soil must also be kept consistently moist. Wildflowers that grow in drier conditions should have their container soil dry out between watering, then give your wildflowers a good soaking. Allow your wildflowers to form seed pods after they bloom so they will reseed in your container, as they would in their natural environment. You may want to plant seedlings instead of starting your wildflowers from seeds, because many wildflower seed varieties germinate slowly, sometimes up to two or three months. Additionally, most perennial wildflowers grown from seeds will not bloom the first year if you plant them in the late spring or early summer. Planting bedding plants of perennial wildflowers such as black-eyed Susan, sweet William, foxglove, Shasta daisy and purple coneflower will ensure you have blossoms that season. Plant native grasses with your wildflowers to add texture. If you use fertilizer, use a liquid fertilizer, more diluted that the directions indicate, or a timed-release fertilizer, and apply it only once per season. Remember, wildflowers grow and bloom with no additional feeding in their natural environment, and in some cases, fertilizing your wildflowers may actually harm them. Can Creeping Phlox Be Planted in Containers? What Plants Go Good With Marigolds in Pots?